If you are applying to a Speech-Language Pathology graduate school program anywhere in the country, you may need to submit a statement (or letter) of intent. Did you already Google “How to write a letter of intent for Speech Pathology graduate school? “There are limited, relevant results. First off, what is a statement of intent? In my opinion, it’s like a first date with a total stranger. Only you are trying to convince them to marry you, blindfolded, based on a test score, GPA, and resume. Talk about pressure. *Applies Makeup* But truly, the statement/letter is your opportunity to highlight strengths and weaknesses, explain your passion & interest in the career, and answer questions they may pose. First dates are always awkward, so let’s wade through this one together. Now then, let’s focus on the specifics of pre-writing and writing the statement/letter in relevance to Speech-Language Pathology. What keywords are found on the department’s website? – Try to work those in. What is the mission statement of the department or college? – Use some of the phrasing, if possible. What areas are some of the faculty researching? – Mention a similar interest, if you have one. Have you spoken with faculty about the focus of the program? More clinical or research based? Key ideas to weave into your writing. Check out ASHA’s mission statement and vision; see if those spark ideas for your letter. The first sentence should be unique. Offer a quip or quote that inspires or provokes interest. Avoid “I like the field of Speech-Language Pathology because…” Come on, be unique. Try “How often do passion and profession come together? For me,…” <–Something thought-provoking, yet speaks to your personality or interest. 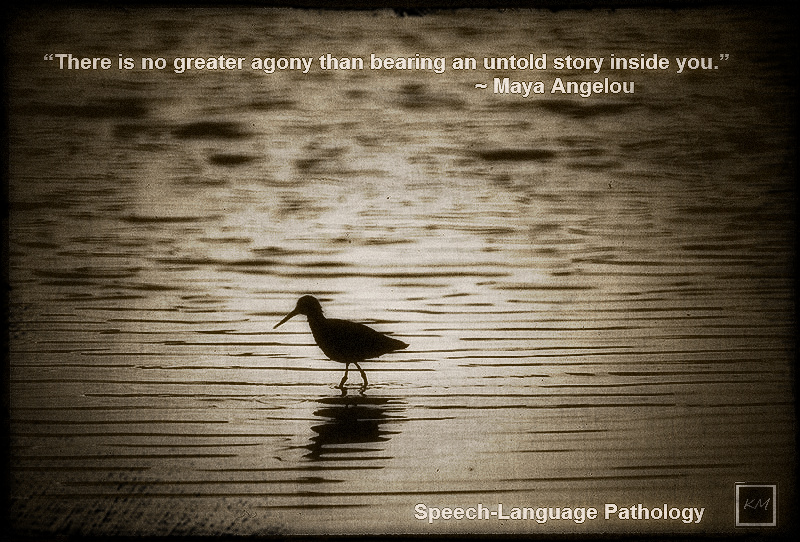 Subsequent sentences should offer insight into why you want to study Speech-language pathology. Don’t give a history lesson, but offer a fresh perspective. Show that you have done some research, but also make it personal. Discuss your compatibility with the program, including factors leading to your decisions, relevant experience, or how your interest in the field has developed upon further study. For instance, discuss positive stories you read about their academic record, clinical practice, passing rate for Praxis, etc. Express interest in what clinical areas and/or populations you want to pursue. Explain what you have done to prepare for the challenges graduate school poses, if admitted. Consider mentioning an area of growth clinically, then how you will use your strengths to address it. BONUS Points: In my experience, if you can mention any knowledge or experience you have with multicultural populations, this can help you stand out. It’s a big push in grad school. How does your interest and long-term plan relate to their program vision and mission? Mention those key terms again. Motivated, qualified, experienced, culturally sensitive, empathetic, energized, diversified background, driven. All done?? NOOOO. Let your professors read it, ask a professor in the literature department to read it, have your friends read it, have your mom read it, have the Dean read it. Get feedback. Take all of the edits into consideration to create the BEST letter of intent the graduate program has ever seen! I’ve been looking for resources from SLP students for a while now, and I’ve never found anything as informative as this blog. Thank you for taking the time to share with (hopefully) future grad students! Hello!! I am from Chile and I want to apply to this program in USA since in my country there is no such a thing. I have a degree on linguistics and literature. I also stutter since I was 4 so pretty much I’ve been working in my speech since then, I really want to enter this program. If you could help me with some lists of Universities, because I have no idea of anything. Thank you, and I hope to hear from you soon enough. Thanks for this!!! It helped me so much with my letter of intent and I was totally stuck. So it is NOT necessary to start the letter with “My name is ______ and I am applying to the _______ programs for Spring 2014….”?? I have a great hook but just nervous not to put that info in the first paragraph (even though they already have that info). Let me know! Awesome -that’s what I thought but wanted to be sure. Thank you so much! Thank you very much for this. I was a bit nervous about writing my personal statement, but this blog helped a lot. First of all, thank you very much for taking the time to blog about your experience as a prospective grad student. I am so thankful to have found this blog! I am in the process of applying to grad schools and writing my letter of intent, etc. I plan to apply to 5 schools so I want to write a letter that I can use for all schools, hoping to have to make only minor adjustments. How long would you say a letter of intent should be. I want to stand out and include my experiences but don’t want to ramble. Any help is appreciated! Thanks again! Thank you for the advice! I’m feeling slight trepidation about the letter of intent, even though I generally feel very confident about personal essays, etc. I nailed my essays for undergrad, but I tend to do well with a whimsical essay that sort of pokes fun of me and the writing process, if that makes sense. I can also turn up the sap factor if needed. However, I get the impression that the letter of intent needs to be more serious and professional. I get that, but is it possible to write it in a way that doesn’t just seem earnest and boring? I’m afraid to try my usual method but I don’t want to sound like everyone else, either.